Subject: Is Investing in Marijuana Stocks Safe? Is investing in marijuana stocks safe? The short answer is yes. Although, many marijuana stocks on the market today are speculative. Investing in marijuana stocks can be safe, and it could be very profitable. In 2016 alone, legal U.S. marijuana sales are projected to reach between $6 billion to $7 billion. But just like with any other investment, investors have to perform due diligence. And because marijuana is still illegal under federal law, investing in marijuana stocks is speculative. There are also marijuana stock scams. That's why today, we're providing readers with three tips for investing in marijuana stocks. We'll also show you how to receive 90-page cannabis investing guide called "The Roadmap to Marijuana Millions" at the end of this article. One of the first things most investors don't realize about marijuana investment opportunities is that they are available in a variety of industries. Your options are not limited to companies that actually sell marijuana. Investors should also have a clear understanding of how these companies make money from marijuana. For example, one of our marijuana stocks to watch in 2017 is mCig Inc. (OTCMKTS: MCIG). This company sells smoking tubes filled with marijuana and other cannabis products. We are also watching pharmaceutical companies that use marijuana to develop therapeutics and medicine like GW Pharmaceuticals Plc. (Nasdaq ADR: GWPH). Over the last 12 months, GWPH has climbed 35.57%. In comparison, the S&P 500 has climbed just 7.06%. However, if you don't want to invest in companies that directly sell or use marijuana in its products, there are also marijuana-related stocks to invest in. Most investors wouldn't directly associate Scotts Miracle-Gro Co. (NYSE: SMG) with marijuana sales. In 2015, Hagedorn bought two companies that sell accessories, soils, and fertilizers for pot growers. Then in July 2016, Scotts Miracle-Gro invested $120 million in Gavita International, a hydroponics equipment company. And there are other companies like General Cannabis Corp. (OTCMKTS: CANN) that provide consulting services, cash transportation, video surveillance, and leasing of cultivation space. Grow Condos Inc. (OTCMKTS: GRWC) is also looking to cash in on the climbing demand for marijuana real estate and growing space, offering turnkey solutions for marijuana growers. So the first step to safely investing in marijuana stocks is to determine exactly how you want to invest in the industry. Investing in marijuana stocks is speculative since marijuana in the United States is still illegal under federal law. Investing in marijuana stocks should only be a small part of a balanced portfolio. And with penny stocks in general, there will always be more losers than winners. Penny stocks deserve the same scrutiny as the rest of the stocks you normally invest in. Many of the marijuana stocks on the market now are penny stocks. When investing in marijuana penny stocks, never allocate more than 2% of your investing capital. That allows you the potential to make huge profits, but it also shields your portfolio from huge losses. 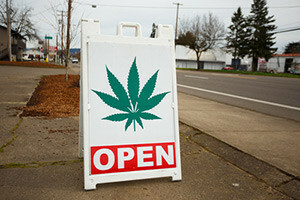 Because of NYSE and Nasdaq market listing requirements, many marijuana stocks trade on the Over-the-Counter Bulletin Board (OTCBB) or the Pink Sheets. And because the OTC Market and Pink Sheets have less stringent rules for reporting and disclosing financial information, the market can be ripe with scammers. Scammers can more easily pass themselves off as legitimate businesses on the OTCBB or Pink Sheets. But the Pink Sheets have two classification systems that will help you in your research: "PremierOX" and "PrimeOX". Companies listed on PremierOX have at least 100 shareholders with a minimum of 100 shares each. The stock sells for at least $1 per share and meets the requirements to operate on the major stock exchanges. PrimeOX companies don't have a minimum share price, but they have at least 50 shareholders with a minimum of 100 shares each.